Hello, I'm sorry I haven't been around for a while, I have not really known what to blog about. I now have a few posts in mind and am setting to work scheduling them all in and getting myself back in to a routine. I have settled into my new job just fine, the people are all lovely, the extra time of an evening and the lay in of a morning is amazing but I am really missing everyone at my old job. I have been in touch with them and am meeting up with quite a few of them at various times over the next couple of months, will be great to see them again. I have been awarded this award before but as 2 lovely ladies have awarded it to me again I thought it would be rude not to post about it. firstly Julie at A Tale From Toadstool House and secondly Julie from Pretty Little Jewels - thank you so much ladies. Pass on the award to 7 amazing blogs - this is where I am going to fail. I have been awarded this award before and did pass it on then, I know we all seem to follow each other and it has been going around for a while, so if you have not been awarded this award before please accept it from me. 1. I don't like having my hair cut. I find it so boring just sitting there and having to sit still, anyone who knows me knows that I am a fidget, I just can't help it. 2. As a child I was once on the radio. I was being interviewed for a programme about Parkinson's Disease. I must have been about 7 at the time, it was great fun and something I still remember clearly to this day. 3. I still feel as though I am wanting to achieve something more in my life, the only problem is right now at this point in time I am not quite sure what, but I am hoping it will come to be in due course. 4. I often think what my life would be like if I were a character in a movie. Do you ever sit and watch a film and imagine yourself as the leading lady? I often do it, OK I always do it. 5. 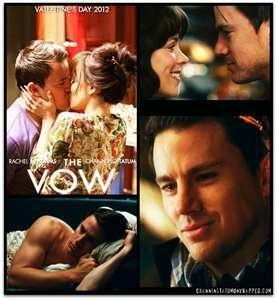 Talking of films, I went to the cinema last night to see The Vow. I love going to the cinema and watching a chic flick, well even better :) Channing Tatum mmmm yes please! 6. I love the TV series Newlyweds and am gutted that they split up. I have to confess to actually owning the full series box set. I love Jessica Simpson even for all her blonde moments, there are many times I am reminded of myself. 7. I still find it amazing that people actually read what I write. I have 114 followers, that is amazing, thank you so much to all my new and old followers for supporting me, I love you all. I will be back tomorrow with another award, how lucky am I.
Glad you are enjoying your new job :) congrats on your awards sweetie. Love your facts, especially the Jessica Simpson one !! I love reading facts about bloggy friends!!! I was awarded this but having trouble thinking of 7 things I haven't shared before!! !